Source code: included in the installation of TRichView. Compiled demo projects: included in TRichView demo projects. Version: v1.23.2 for ReportBuilder v9–19. The wrapper implements two objects: TppRichView and TppDBRichView. 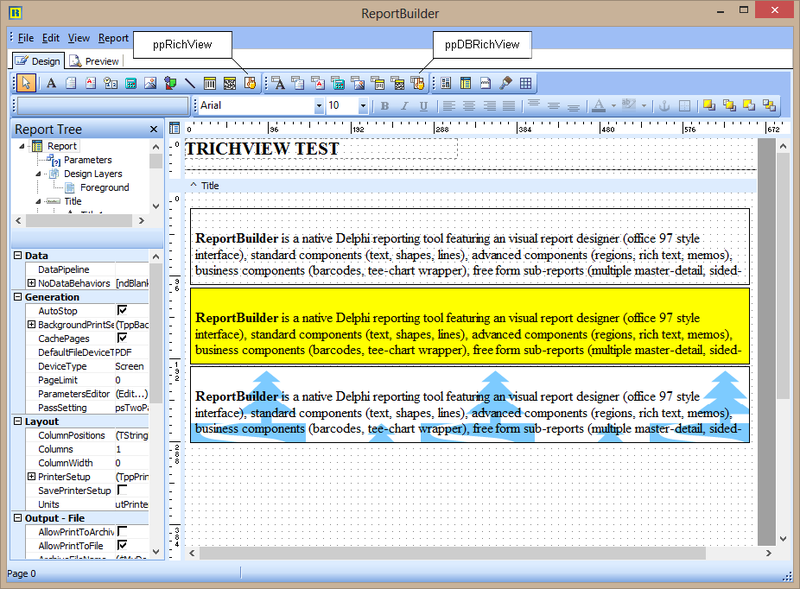 They can be used together with (or instead of) ReportBuilder's own richtext objects. TppRichView and TppDBRichView provide much more sophisticated formatting than the standard objects, including tables, background images, multilevel numbering, etc. In new versions of ReportBuilder, the wrapper provides a high-quiality export to PDF and RTF files without using other thirdparty addins. To activate this feature, include ppPDFRendererRV and ppRTFRendererRV units in your project.